A lens is good enough to take pictures. 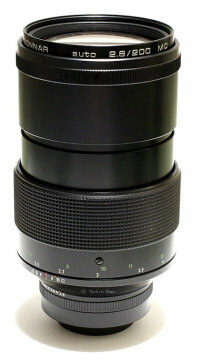 In reality, however, cameras capable of replacing lenses and lenses of different focal lengths are supplied in quantity. So why interchangeable lenses? The answer is that every lens has its own angle of view which corresponds to its focal length. This allows the photographer to interpret and/or record each subject individually. Angle of view is the angle in a lens between imaginary lines drawn from opposite edges of the image on the film plane to the optical center (second nodal point) of the lens. The object size and focal length determine the angle of view and only objects within this angle will appear in the final picture. The human eye, when focused at a given point, has a field of vision of about 140°. When the eye is moved it then covers about 180°. Naturally, everything within this field of vision is not clearly in focus, and in reality the human eye can only discern colors and shapes within an angle of 50°, about 20° for absolute identification. In other words, the function of the retina of the eye varies depending on whether a person sees things consciously or unconsciously. However, since the angle of view of a lens is fixed and determined solely by the focal length, what the human eye identifies in a given photographic situation is different from what the lens wi I I capture on film. Practically speaking, angle of view is directly related to focal length. The shorter the focal length, the greater the angle and the smaller the image on the film. For example, when the focal length is doubled, the angle of view is reduced by about one half and the image size in the picture becomes larger. When replaced, the new lens of a certain focal length offers not only a different angle of view, but also different effects of perspective and depth of field. Perspective means the distorted effect in the space relationship of objects, i.e. a distant object seems smaller than it actually is. With a wide- angle lens, perspective is more exaggerated and is increasingly apparent as the angle of view becomes greater. With telephoto lenses, however, perspective is almost lost as the focal length becomes larger. You can see the effect of a lens on perspective as you look through the viewfinder of an SLR camera. To make the most of this phenomenon, remember that a wide-angle lens expands the vista and makes faraway objects appear smaller. If the main subject is important, you must get as close to the subject as possible to maintain a proper balance in the photograph. and by the distance from the subject in focus to the film plane and by the focal length of a lens. As the camera-to-subject distance decreases or as the aperture is made larger, depth of field becomes shallower. By making the aperture smaller or by increasing the camera-to-subject distance, this depth is increased. Another factor in depth of field is the focal length of a lens. The shorter the focal length, the greater the depth of field. The beginning photographer often chooses a wide-angle lens because it takes in a greater total picture area. Likewise, he chooses a telephoto simply because it makes a distant object appear closer. The advanced photographer, however, understands the illustrative characteristics of lenses and considers such factors as controlling perspective and varying depth of field effects. The key to utilize the lenses most effectively lies in the mastery of these characteristics.